Where do you go to check on the weather? A favorite website? A reliable app? Or maybe just good old Google? All these options are valid, but in this day and age, why not have your very own weather station right in your home? The Netatmo Weather Station is a neat gadget that can do just that. With a radio and Wi-Fi connection combined, it sends the current weather conditions from both outside and indoors straight to your smartphone or tablet. So does it really work? Read on to find out. As usual, you can also win this iOS and Android compatible weather station for free! More details to follow. For the record, we should state that this review unit was purchased at our own cost. This review isn’t affiliated with the manufacturer, and is therefore, completely unbiased. This is what we truly feel about the Netatmo Weather Station. There are lots of different weather stations you can buy if you need to stay on top of your indoor or outdoor conditions. Most of these stations use simple displays to tell you about their findings, which means you get the information you need, but you only get it when you’re home, looking at the display. The more modern variety of weather stations can connect to your computer, giving you access to the data from anywhere, as long as you have access to that computer. The Netatmo (which you can currently get for $179 on eBay) does things a little differently. The Netatmo Weather Station stores all your measurements on its own servers. You can then access the data using your smartphone, tablet, and computer. This means you can truly stay on top of your home conditions, even if you’re away for an entire week. The Netatmo is compatible with iOS and Android devices, and uses both radio signals and Wi-Fi for data synchronization. It measures temperature, humidity, carbon dioxide level, barometric pressure and noise indoors, and temperature and humidity outside. It can also provide custom alerts, in case there are certain conditions you want to be aware of immediately. So how does the Netatmo really work? To understand that, we first have to take a look at the station itself. The Netatmo Weather Station comes with two modules, a bigger indoor module and a smaller outdoor module. It also comes with all the necessary accessories to keep these modules charged, working and convenient to use. These include a wall charger with multiple adapters (depends on the country you’re buying it in), a standard micro-USB cable and a pair of AAA batteries. It also comes with a sticky tape mount, and a set of one screw and one screw anchor. You can use the latter two to hang the outdoor module on an outside wall, if there’s no suitable surface to place it on. The modules themselves are covered in single-piece aluminum which makes them durable as well as weather resistant. The outdoor module can be opened as necessary to change its batteries. According to the Netatmo website, one pair of batteries should last up to a year with standard use. The wall plug is used with the indoor module, but this is not a charger as you might have expected. The Netatmo indoor module doesn’t have a battery of any kind. This means it has to be plugged into the wall in order to work. While this might seem like a backwards decision, it actually makes sense for a device like this. A rechargeable battery would not only make the module much heavier, it could also affect its temperature reading by heating up itself. Since the two Netatmo modules come paired out of the box, the actual setup process you need to go through is pretty easy. To set things up, you’re going to need to download the free Netatmo app from iTunes or Google Play. Alternatively, you can plug it into your computer to set it up without installing the app. Once you launch it, the app will take you through every step of the setup process. During this process, the app will recognize the indoor module, update its firmware if necessary, and help you set up the Wi-Fi connection to be used with the indoor module. Once that’s done, the outdoor module will transfer its measurements to the indoor module via radio, and the indoor module will upload all measurements to the cloud using Wi-Fi. This initial pairing (if using the app) is done via Bluetooth, so if you’re running into difficulties while trying to pair, check if Bluetooth is enabled on your device. This happened to me while trying to pair the station with my Android device, and the cryptic error I got was no help at all. It’s also important to note that the two modules must be placed no more than 100m (330 feet) apart, and too many walls between them may cause interferences as well. Once everything is set up, your weather station is active and measuring. There’s nothing more you need to do, except to check the app to see the conditions. The app’s interface is a little hard to figure out at first, but once you locate the almost invisible “i” button on the bottom left corner, things start to clear up a bit. The top section shows you everything you need to know about outdoor conditions, including current temperature and humidity, and the highest and lowest measurements to date. The indoor section below it includes the carbon dioxide color spot (ranges from green to red, according to carbon dioxide measurements), as well as pressure and noise measurements. The two bars in the middle summarize your general indoor condition (ranged from Very Good to Bad), and provide an air quality measurement, showing the level of pollutants. Also included is a local weather forecast for the next few days. When left alone, the Netatmo sends a reading every 5 minutes or so. Want a measurement done right now? This is how you trigger an on-demand measurement using the indoor module. The video is showing me plugging in the indoor module, at which point it flashes green, and then triggering the measurement by touching the module until it flashes blue. You can also blow on the module to trigger a high carbon dioxide alert, if you feel like it. It’s not only about current measurements, though. The app gathers all the available data, which you can view in graph form. Use the dropdown menu on the right to switch between the different available measurements. You can zoom these graphs in and out, and see the exact result of each measurement made, its time of day, and its date. But what are you to do with this information? If you want your conditions to stay just so, you can set up the app to alert you when things go awry. By default, the app will alert you of extreme conditions such as a freeze, a pressure drop, high carbon dioxide levels and low room temperature. You can turn any and all of these off, and add any outdoor or indoor alerts you feel are necessary, or tweak current ones to better suit your needs. The Netatmo app doesn’t like it when conditions go sour, and it won’t hesitate to tell you so. At the end of each week, the Netatmo will provide a weekly summary, telling you about notable events that happened this week. These include, for example, the carbon dioxide max point measured, the lowest indoor temperature measured, and more. Once you’ve been using the station for a while, you may want to view weekly, monthly, or even yearly graphs. This is possible using the Netatmo Web app, which is yet another way to access your measurements and configure your station. From here you can also access the Netatmo World Map, which aggregates outside temperatures measured by a large number of worldwide users. Want to share the fun with family or friends? Invite them to view your data using Facebook, Twitter, Google+, LinkedIn or email. They will then be able to see everything you see, without owning a station themselves. You can also choose to contribute your outdoor data to the world map, or rather, opt out of contributing, as this is enabled by default. The app also includes a pretty good help section, not only for operating the station, but for understanding what each measurement means, and for making the best use of the app. Despite my expectations, having the Netatmo around turned out to be an addictive experience. I check out the app first thing every morning and last thing every night, and words like “cold” and “stuffy” suddenly get a whole new meaning with actual measurements to back them up. Prior to having the Netatmo, I kept feeling like there was “no air” in the bedroom, especially in the mornings. The Netatmo showed me I was right: carbon dioxide does in fact go through the roof when sleeping in a closed room without ventilation. It also taught me that even a small crack in the window can improve things greatly. After some initial trouble on the first day, trying to figure out how everything works, and some problems while trying to re-configure my wireless network, the Netatmo became a complete hands-off experience. I could forget it existed for several days, and then check out the app to see all the measurements I missed. It’s definitely a gadget you can buy, set up, and trust to continue doing its job without constant tinkering. The drawbacks? There are several. The first and foremost, is the price. $200 is quite a lot to pay for some weather measurements. The station lacks a carbon monoxide sensor, which could have made it a life-saver, and also lacks any kind of display on the modules themselves, requiring an additional device every time you want to see how cold it is. It’s nice to have access to data from everywhere, and the station definitely works well, but are you willing to pay $200 just to know how cold or hot it is in your room? There are much simpler and cheaper sensors out there that can tell you that, and while you may not have access to them while out of the house, most people don’t really need that. Should You Buy The Netatmo Weather Station? Do you need to know about your current conditions at all times? Do you want to be able to leave the house and stay on top of your indoor weather? Do you have a hobby that requires constant weather supervision? Do you actually need weather alerts to appear on your phone? If you answered yes to most of these questions, the Netatmo Weather Station is a great buy. If not, the Netatmo is still a great toy, but at $200, I would give it a pass. MakeUseOf recommends: Buy it only if you really need indoor weather tracking and alerts. How do I win the Netatmo Weather Station? This giveaway begins now and ends Friday, January 3. The winner will be selected at random and informed via email. Congratulations, Natalie Schilla! You would have received an email from jackson@makeuseof.com. Please respond before January 15 to claim your prize. Enquires beyond this date will not be entertained. Explore more about: MakeUseOf Giveaway, Weather. Dip Your Toes Into a Smart Home, with Stitch from MonoPrice Starter Kit (Giveaway! )Google Chromecast vs. Android TV Stick – Which Should You Buy? This would of been cool to win my HUSBAND is always checking the weather i swear when he wakes up ,when he gets home ,before he goes to bed and he even has a app .Tsk tsk hopefully another chance to win this gift. I know he would really use this daily. Because my husband would love to own this. He is a weather nut. It's amazing how many different temperature zones we have in our house. Would be great to know allergens inside and out. My son does snow plowing, and it sure would come in handy. My apartment doesn't have a direct exterior window for some lame reason. I live in the mountains where weather forecast is a must. I can not get weather for my area. I can get it for near by towns, but since they are miles away, it isn't always accurate. It could be raining at my house and the sun is shining in the reporting town, so this would let me know what is happening at my home and if I'm away, I can get it on my phone! What a wonderful time we live in! I live in TN and the weather is ALWAYS changing! This would be so nice to have to kinda know what to expect! I live in Kansas. That should be reason enough right? No seriously though the weather changes every five hours here. I'm on wundergound everyday.It is great seeing the weather in every nook and cranny of this city. It would be nice to know whats going on outside my door. Bcoz its a cool gadget..
My husband works outdoors and a lot of the jobs are dependent on the weather so this would be handy to use to make plans for his up-coming jobs. Because I'm OCD about the weather! I'm really interested by the weather and would love to learn more! I work outdoors, it is important for me to know how i need to dress for the day. I'd find out how wet I'm going get on the way to work..
my young children enjoy watching and learning about things, this would be a fantastic way of introducing the weather to them! We have a large orchard of apples, plums and pears and it is very useful to know the temperatures and other weather features each day. Knowledge is power, and this would allow us to have more knowledge! I'm in an apartment & can't see outside (view blocked) & it would be really nice to know what to expect when I go out. I'm mainly entering this for my family back east. They could really use this in tornado alley. But it would be nice to have. I would love to be able to know the weather at all times. I live in Virginia where we can get a lot of snow and high winds! Something else I had no idea I needed! :D It's looks awesome! I'm always going out not knowing the weather. It would be so handy to know the temp outside without having to go out!!! My husband and family live in southeastern NC and the weather can be very intensifying at times whether it be a tornado,hurricane or a pop up summer thunderstorm!! My husband used to be a storm chaser years ago but now that he has a family he doesn't do it anymore!! He has always wanted a weather station. Plus, we are both ham radio operators so in emergencies we can relay the weather back to our county we live in if we have a weather station! Thanks so much for the opportunity! I am building a weather station with my Raspi, but the sensors are quite bad. So with a Netatmo it is quite easier to get all weather conditions. With all the changes in weather going on around us I would want to be able to keep track of bad weather. So I can see how cold it is without going outside! Combination of wife worrying about leaving her washing out, and me worrying whether or not to water the garden! We need one of the these when we take my son kart racing, knowing all the information the weather station provides would help us with knowing how to help set up his kart (small temperature changes can make big differences) and hopefully therefore win some trophies. My carbon dioxide monitor is broken. My father introduced me to meteorology and weather watching. It's been a bit of a fixation since. We used to have a Government of Canada weather station in our backyard to record wind, precipitation, temperature and so forth. This would be an awesome way to introduce the understanding of weather to my son and pay homage to my Dad at the same time. I love watching the weather. I studied weather in the Navy. My fiance and I check the weather constantly, especially this time of year with Chicagos-degree numbers. I have been interested in weather since high school and would love to have this awesome device to keep me informed. I need the Netatmo to keep track of the weather right where I am, not where the forecasters are monitoring things. My husband is infatuated with the weather and studies it. This would be PERFECT and right up his alley! Thank you for the chance to win this. Amazing! I just love the weather ! I love knowing the weather! I want to know the actual weather. It just looks awesome and the information is priceless. Yes, one for me please! My husband is obsessed with the weather! This would be a very useful gadget to have at home. I live in a town close to the south coast of England, which is within a set of hills. A microclimate is extremely common, the difference a mile makes in weather conditions can be something quite special. I'm kinda a weather nerd. I am always curious to know what the temperature is outside when I get up as well as the temperature inside. This weather station is something I would have fun with, love to play with gadgets!! THIS WILL HELP ASCERTAIN THE BEST PERIOD TO GO CAMPING IN ANTICIPATION OF MOUNTAIN BIKING! It would be very useful, I need an accessory like this. Especially when I go to work outside the home. I need this to forecast the weather. I need this for safe boating. My son and i would love this. It would be a nice educational tool to teach and introduce him to following the weather. For an accurate description of what the weather will be like. my other half is obsessed with the weather. he watches all the forecasts and makes comments about it when he looks out the window. he thinks hes an expert and knows it all; with this he would be more accurate at least for me to stop thaking the mickey out of him. Need to know what the weathers like so I can plan what outdoor jobs I can do. This would make the weather a lot more interesting. I would sooner trust the weather station than the announcers on tv or the radio!! The weather here is so unpredictable. My current weather station is faltering. And this would "force" me to but an iPad! I love seeing the temperature without braving it and to see what it is going to do. My wife is obsessed with weather and would love this. I measure the humidity for pets! My husband voluntarily looks after two cricket grounds and checks the weather every day to plan the work ahead. He usually looks at the BBC forecast on the internet but our internet connection is sooo unreliable that often leads to frustration. His own weather station would be great. It would be an informative tool to have because the information it provides is useful in many circumstances. To keep track of the weather! Up-to-date weather on your fingertips. Living on an volcanic island, I need to know air quality and weather changes. My hubby paints motorcycles and needs to maintain a certain temperature & humidity level in the shop & paint booth. This would be great for him! My mum's so obsessed with all this weather thing that she'll really love to have this by her desk. I need to know air quality and tracking the weather. Because we live up in northern Canada!! Our indoor - outdoor thermometer gave up on us just before Christmas...This would be a very nice device to pay too much attention to during the winter "Blah's"
Living in Florida my weather is changing all the time, I could really use this device to help keep up with the changes. Since i have fishes in my home. They require temperature maintenance. I need this in my home because we get tornado and lots of bad winter storms. Cause i need to know air quality in my room, to make it better. A useful gadget for my balcony. I don't really need it. But it would be very cool to have! I live in an area with very limited local radio or tv. I need know what the weather is before I drive anywhere. Our weather changes so often and so quickly that we find ourselves checking the forecast often. I want this because it'll be my own personal real time weather station. I need this in my home...why? cause I'm a gadget fanatic and have yet to get myself a weatherstation. Nice product, high pricetag but it does the job and does it well. I'm a gadget addict. I don't NEED it - I'd really love to have it though. My brother is a meteorologist and he'd find this really cool. This system seems like overkill unless you are a weather nerd or have a technical job that requires this detailed monitoring. Need to keep track of the conditions in my small apartment. It doesn't have much air flow and I wonder how bad it is. Generally, only first name and the first letter of the surname are posted. If guest commenters post their full name into the respective field, however, it will be shown in full. I need one of these to monitor air quality in our house.. I need one of these to monitor air quality in our home. Weather varies so much it would be interesting to see if this would be of any assistance. I need it to know how to dress on my morning walks to work! I enjoy knowing what the weather is before it Happens . I need it because I like to plan my life outdoors. Gardening, hiking, beach, ect. I need the Netatmo because I love in an area prone to bad weather, tornadoes, hurricanes. Living in Montana this would be a great help in deciding whether it is the smartest thing to venture outside. The best feature however, is that the barometric pressure indicator would come in handy, as I could stay on top of incoming migraine headaches. thanks for having this sweeps, its great ! i need it coz d weather now a days is becoming a hack of headache, n i dont wanna get drowned in Tsunami, or blown up in katrina, or been swallowed at d bottom coz of an earthquake.. thus, i need to get updated every now n then, n as v get a life just for once, i wanna live it the fullest.. thnx.. I'd love to have one in my home just to be able to be more prepared for serious weather threats! 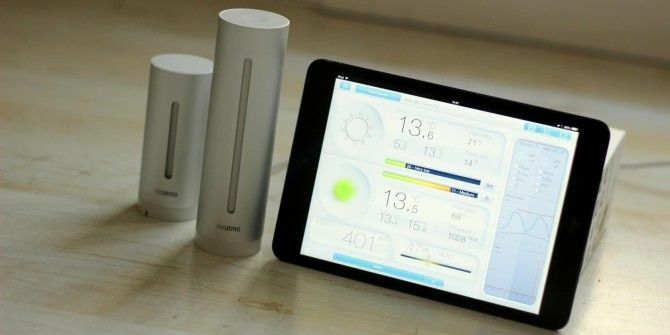 I would love to have a Netatmo Weather Station in my home because we are always on the go. Would love to have deets immediately without having to wait for the weather channel etc to load. To make finding weather in seperate locations much easier. To make finding the weather much simpler. ..because weather data can be inconsistent at times. Having an different source might help. Just to keep up with the weather! My techie husband would love this! I live in Northern Ontario, and even the Weather channel doesn't broadcast the weather for my town anymore (the weather instrument is in a city two hours away). So this would be helpful to know what the actual temperature is outside. I live in the frozen north. It's always good to have a heads up when winter storms or -30F temps are on the way! My husband is a weather nut and we are in the country and want to know what is coming! To keep up with the weather. This would be awesome for trips! My family always makes fun of me for looking up weather -- they call me the weather station. How great would it be to really have my own weather station!!! This would be a great way to test air quality inside. I am always curious about it. My son is a weather nut. He would love this. This would be really helpful on trips. I want to know the weather at any time of day and night that would be prepared for any weather conditions. Always looking to ways to tech up the home. And this would be a huge conversation piece for the grandfather when he visits. Huge change since the old barometer outside the kitchen. I live in a very tropical country, Singapore. The weather here is very unpredictable, now it is sunny and the next moment it pours. There is also an issue of haze here occasionally... With the Netatmo Weather Station, it would provide me with an accurate analysis, followed by a good weather forecast daily. This make my life easier as I would know when to take my umbrella out! Air Quality is horrible in the city I live in and I have a young son who loves to play outside. Crazy weather we live in, I think this is useful. The more weather info we have the better! We now have two bunnies living in our house. While they are fine in the cold, heat could make them really sick. Knowing the temperature at all times would be great! Cus looking out the window is SO last century. Living in New England conditions change quickly . I need it because that's awesome device!!! I like it, it’s useful gadget! to know the weather always! I like it very useful. I like the new gadgets! Sounds really interesting! I'd like to have it because i live in a quite rural area so the forecast usually doesnt say anything about where i live.. it would be very neat to predict it from my own measurements! The Netatmo Weather Station would help me monitor my holiday home from remote. Because I also use Vera from Micasaverde it would allow me to switch on the heaters in time to prevent pipes from freezing up. I have rheumatoid disease, and knowing what the weather is inside and outside as well as what it's going to be later would be a big help in planning activities and medication. Plus I love this sort of gadgetry. May wife suffers from severe arthritis. She is effected greatly by on coming weather fronts. I thought this device might give her an edge in dealing with her illness sense there is little else that helps her. I always wear the wrong clothes for the weather. Im suprised by all kind of rain and snow every time I'm on my way. I need something that tells me better. I love the concept of being able to check the conditions inside and outside my home. It will help me find out whether it is really cold, or whether it is just the way I feel. There's not many reliable weather stations out where I live. With the Netatmo I'd like to add to a crowd-sourced weather service like weather underground. I like innovative gadgets and it'll be quite useful to keep a track of the weather before going out! Why do I need the Netatmo?! Because I live in the Pacific Northwest. There's a microclimate every other mile, around these parts. The current weather in town can be very different from out at the airport and entirely different from out near my house. Because i love innovative inventions like that! The weather around my house is often different from what is being reported. The weather in New Zealand can go through four seasons in one day, so the Netatmo would be helpful. I like it, it's useful gadget! This would help, living in Kansas the weather is crazy weird and changes so frequently. Austin is one of the worse cities to have allergies.I also have had 4 and a half years of shots. My girls love science and weather and would love to have this! I need this because It's Michigan and changes every five minutes, and my 10 year old is always watching the weather channel! Just for fun and free! It will be convenient to have always up-to-date weather forecast at any time. Weather change very fast in here my country, always have to check weather forecast website before going out or plan anything. So with this gadget I believe it help reduce the time i need to check on several weather forecast website. And it looks very COOL. I would love to have a weather station. I remember when I was about 9 or 10, my parents gave me a 'weather station' for my birthday. It was really cool for the time. Had analog thermometers for temperature and a wick over the other one for determining relative humidity. The wind 'sensor' had a weather vane that rotated a pointer to tell which way the wind was blowing and an anemometer that rotated another pointer that you timed how many times it went around in a minute to calculate the wind speed. Also had a barometer that you filled with colored water and was able to tell whether barometric pressure was higher or lower that day. I really liked it and every time we go to Walmart, we check out the clearance section and there are the new electronic weather stations at the end cap and I keep looking at them wanting to buy one. Thank you for the giveaway and reading my ramblings. present for my dad, who is weather-obsessed! My current weather station is broken and I love knowing what the weather is like so that I can walk the dog. I need this cause aour weather channels are not very accurate where i live. I do a lot of driving and around this year it's invaluable to know in advance if the local conditions outside are conducive to black ice or not. Inside the home, well, that's a tricky one, our bodies make great sensors anyway! because my hubby loves anything "weather"
It's difficult to trust how accurate the temperature is in my house so I like to know if I need to start making home improvements to make my house to become more energy efficient. My parents don't know how to use a smartphone and the internet really well. I need it because I am fascinated with the weather and this is just so cool! Our weather changes dramatically in short periods of time. Important for us busy parents to be able to plan when the opportune time will be to mow grass or shovel snow or how to send the kids to school prepared for the weather or when to change plans to avoid rough weather. I work outside all day so this would be great. I need a Netatmo because I love following weather data for my home. i am working outside and this will give me a heads up on the weather. i am outside all the time this will give me the heads up on he conditions outside. I'd like to be able to connect this to my A/C system so it turns itself on/off as needed. I almost lost my roof in a summer thunderstorm. Have been frightened of storms every since. would be great to have a alert to watch for bad weather. I live in snow central! of course i need to actively monitor the weather patterns! Lately the Weather Channel has been way off on the temps. This looks like it would be much more accurate and plus I'm a weather geek. My Great-Aunt named me "Weatherman." and was so named by Her (and only Her.) to Her passing. All because of a time when She came to visit us one Winter. I drew a large weather map on the kitchen wall( I had copied the CBC Halifax meteorologist, Rube Hornsteins's weather map) and explained to her all the reasons why She had to Stay. Told her the weather was too bad for travel and I strongly Insisted she should wait for Spring, that is I tried as well as I could for a 5 year old. that was 56 years ago but I still wish for a weather station and that She did not have to go Home. Merry Christmas everyone . If you need your indoor weather available to you when you aren't at home, this might make sense. If you need to graph your indoor weather over more than a day, it might make sense. If you win the contest, it definitely makes sense. If not, there are a number of weather stations that can directly monitor your indoor and outdoor weather (including wind and rain). I would also be concerned after looking at Netatmo's site. Outdoor Air Quality is only available in certain areas which means it's being pulled from the web, not measured. There is also no rain sensor listed and the graph looks a lot like NOAA's chance of rain and amount of rain. The fact that it doesn't directly monitor these isn't a problem but the fact that they don't come out and say that is a problem. For k=hiking - I need to know the weather! I check the weather for my family in the morning before we go out. I like to always know what is going outside. Because I like to check the weather. Because my job is very weather-dependant . Because I have a big fear of wind and this would be very helpful! My hubby loves the weather! I don't trust what the TV forecasts and if I have to look for the weather myself, it's always a pain - this would simplify it so much! I find it useful because I have two babygirls who often have fever, so I must check the outside temperature to determine whether they will have fever. In IL the weather changes like my daughter changes clothes. This would be awesome to keep up with it. I love data! I need it to live. Another comment....Yaara, great write up & insight. Thank you for sharing your knowledge regarding this product. Our business is weather dependent....we care for pets. Would be a welcome addition to our current "search internet" for weather relevant information. This will let me check the weather, temperature, and conditions when planning my shark dives and local events. knowing things is basic for living ! I'd like to measure the climate change effects on my hometown. I need it because I have two hobbies that require constant monitoring of the outside temperature, specially when it get cold at night: astronomy, and night-time photography. The weather changes so drastically here. It was in the 80's yesterday and today I put on my shorts and I am freezing! it I had the Netatmo Weather Station I would be comfy in my sweats. The weather outside if frightful, and I want to know what it is before I step outside. Also, to track the trends, near and from afar. I need the Netatmo in my home to tell me what the weather is like outside, without me having to poke my head out the window, so I can dress appropriately for the day. Sometimes we are so spoiled with our indoor heating that we forget how brutal nature can be. One of my Daughters is a total weather geek. She would love this. Because here in Iceland we don't have weather, we only have samples of it. Lovely and interesting giveaway to give a great insight into the weather, would love it. Too many temperature variations in the wild weather of Chicago, and in the wild setup of our home! And I am glued to my smartphone anyway! I like to keep updated with the weather forecast on a daily basis as it affects my projects schedules and completion. I'd like to know the weather everywhere. I live in a hollow, when it snows 3 inches, we get closer to 8. I would like to be able to track our own weather; which is very different from the school that is 2 miles away. Because it's Neat... mo. See what I did there? That is so cool! My son would love it. How many teenagers watch the weather channel? Here in Louisiana, the weather can change drastically in a short time. The Netatmo Weather Station would help us keep track of the goings on so we can TRY to prepare! I can't figure out this weather anymore. Climate change? Human overpopulation? Industrialization? It was 70 degrees on the first day of winter, and the week before, it was 30 and snowing. To check our instable weather, where it can be raining in one spot and be sunny 50 meters ahead. I live in the Azores islands, google them. I have an older home with very little to no insulation and would like to know the conditions inside and outside so I can save energy and money. I have different insulation in different rooms, and it would be helpful to monitor current conditions depending on outside weather and inside ventilation. I just love tracking stuff and it would be nice to know what the environment directly around my home is like. I'm constantly checking weather and such, could be very useful. I don't need it but it would be interesting to use. In the mountains the weather is always changing. This would make it much easier to follow what is happening when away from home. We are atthe end of the block, next to forest in a suburb. The outside ether does not always reflect what we see on TV. As for indoors, I would love to be able to get consistant readings so I can better control how my energy is used. And from my phone isthe greatest plus. Everything else is on my phone. So I can track whether my thermostat is accurate. Living in the middle of nowhere, it is always useful to know what the outside conditions are like before venturing out in winter. Plus, it's a cool bit of kit to have! My indoor temperature is never the same, so I could use Netatmo to track it and adjust the cooling/heat accordingly.